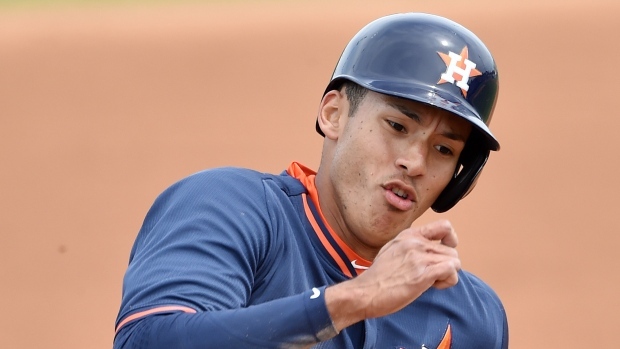 Houston, TX - The Houston Astros selected highly-touted shortstop Carlos Correa to their roster on Sunday. Correa was selected first overall in the 2012 draft and is ranked as the No. 2 prospect in all of baseball by MLB.com. He will join Houston for the opener of a three-game set with the White Sox on Monday. The 20-year-old, who will become the youngest player in the majors this season, was hitting .335 with 21 doubles, 10 home runs. 44 RBI and 18 stolen bases in 53 games between Triple-A Fresno and Double-A Corpus Christi this season. In a corresponding move, the Astros optioned right-handed pitcher Jake Buchanan to Fresno.